On a windy spring morning in an ancient Cretan village, Rory MacLean fell to earth. His mother had died a few months earlier and a single obsession had risen from his grief: the notion to build a feather-light flying machine. And so, on the island where Daedalus and Icarus had made man's maiden flight, MacLean journeyed back to beginnings, back into the Greek myths, and—with the help of his Cretan neighbors and plenty of wine—built a plane and tried to fly. 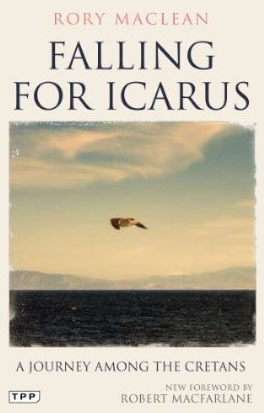 Falling for Icarus is at once a meditation on love, a celebration of the passion for flight, and a hilarious, vivid portrait of a village. Its generous and exhilarating characters restore MacLean's faith in life. Through them, he tells a soaring, moving story about how a dream can transform sadness.